Panic attacks are the most prominent symptom of panic disorder. These attacks often come on unexpectedly and are accompanied by many frightening physical sensations, such as shortness of breath or hyperventilation. The experience of shortness of breath can be a terrifying symptom. You may feel as though you are unable to breathe or get enough air into your lungs. Many people describe it as a choking, smothering or suffocating sensation. You might feel like you may pass out or potentially die, which only heightens your panic and anxiety. 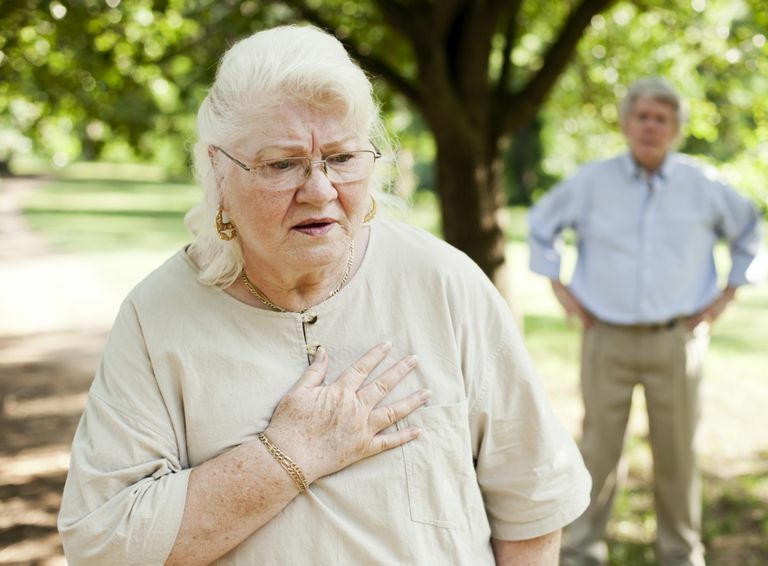 Some people worry that they have an underlying medical condition, such as asthma or heart problems. However, shortness of breath is a common symptom of panic attacks and usually does not signal a larger medical problem. The shortness of breath that occurs during panic attacks and anxiety is often caused by a change in your normal breathing pattern. Typically, we are not conscious of our breathing. When panic and anxiety occur, our breathing may become more shallow and restricted. Instead of filling the lungs with full, complete breaths, we take in quick and short breaths. Known as hyperventilation, this over-breathing causes carbon dioxide levels in the blood to decrease. Reduction of carbon dioxide can cause many physical symptoms, such as tingling and numbness, chest pain and dry mouth. Hyperventilation can also develop into feelings of faintness, dizziness, lightheadedness, and confusion. A person who is hyperventilating may start taking quick and loud gasps of air. However, many people will only show slight signs of hyperventilation, such as coughing and rapid breathing. One of the most valuable things you can do if you experience shortness of breath is to try not to panic, no matter how difficult that is. Shortness of breath is a very frightening feeling. However, if you become even more fearful and anxious, you are at risk of hyperventilating and significantly increasing the intensity of your panic attack. The next time you experience shortness of breath, be prepared to cope with your physical sensations and anxiety-provoking thoughts. There are numerous strategies for getting through a panic attack. It is important that you pick a technique that feels right for you and that you practice this skill on a regular basis. For best results, practice your relaxation technique at times when you are not having a panic attack. By practicing while in a more relaxed state, you will be better prepared to use your strategy when you really need it. Notice your breath and how it has changed. Remind yourself that you are in control of your breathing. Place your hands on your rib cage. Now, inhale slowly through your nose, filling your ribcage with air. Slowly exhale through the nose, taking note of how the rib cage contracts. Repeat several breaths, counting to 10 as you inhale and 10 as you exhale. With each breath, try to relax any tension in your face, neck, and shoulders. Place your hands on your belly. Stay with your deep, smooth breathing. Take a deep breath in and fill your belly with air. Notice how your belly rises into your hands as you inhale and how your navel pulls into the spine as you exhale. Repeat for several more breaths. Set aside at least five to 10 minutes a day to practice this breathing exercise. Try practicing when you wake up to reduce morning anxiety or before bed to get a better night’s rest. By breathing with intention, you may be able to manage your next panic attack, including shortness of breath. You can look into other breathing exercises for panic disorder. Aside from developing your own set of coping skills, you should always consult your doctor or another healthcare provider who treats panic disorder. He or she will be able to determine if the shortness of breath is caused by your panic disorder or a separate medical condition. Bourne, E. J. The Anxiety and Phobia Workbook. 5th ed. 2011. Davis, M., Eshelman, E.R., & McKay, M. The Relaxation & Stress Reduction Workbook, 6th ed. 2008.